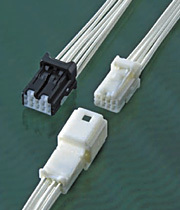 The NH series connector is a highly reliable for connector mating and terminal insertion. This series consist of 0.64mm and hybrid type(0.64mm+2.3mm) terminal usable for control circuit and low power circuit. - The front mask of Female connector assists allure male terminal. - B y set ting TPA (Terminal Position Assur rance) adjust the incomplete inserted terminal to the correct position. - A n extra clip can be attached to the connector housing to secure it to the body.